“Swamiji’s house” refers to three places on three continents. In America at Ananda Village, it is Crystal Hermitage. In Europe near Ananda’s retreat in Assisi, Italy, it is Seva Kutir. (A kutir is a cottage, and seva means “selfless service to God.”) In India in Gurgaon, a city just south of New Delhi where Ananda’s work is centered, it is Guru Kripa (Guru’s Grace). Although these houses are referred to as “Swamiji’s,” it is a principle of his not to own property. “I am a monk,” he writes in his Last Will, Testament, and Spiritual Legacy, “and therefore possess no personal property of any kind, having given to God everything I own, and indeed my entire life.” The copyrights to all his books and music are held in a trust created for that purpose. Crystal Hermitage is owned by Ananda Village; Seva Kutir, by an individual in that community. Title to Guru Kripa is in Swamiji’s name, but only until a proper trust can be established, then Swamiji wants the title transferred to the trust. Crystal Hermitage started as a single dome. (The story of its evolution from humble beginnings to its present spacious beauty is the subject of the book, Space, Light & Harmony.) In 1968, a friend of Swamiji’s from New York City came to visit Ananda. There he had a vision in which Master told him, “Build Kriyananda’s home.” He was a skilled carpenter and offered his services. The original dome cost $5000, including furnishings. Fifteen years later, after both his parents died, Swamiji used most of the inheritance he received to build Crystal Hermitage as it is now. The original dome is the living room of the Hermitage. To Swamiji, the garden is the heart of Crystal Hermitage. “Give my love to the garden,” is how he sometimes ended his phone calls from Italy when speaking to the friend who took care of the Hermitage grounds. Even during the early years when he was building Ananda in America, Swamiji also traveled and lectured in Europe. In the mid-80s, when Ananda began a retreat center there—first in Como, then in Assisi, Italy—Swamiji began staying in Europe for several months at a time. In June 1996, he was having lunch at the Ananda Retreat in Assisi, when a woman visiting there for the first time sat down across the table from him. “Why don’t you come settle in Italy?” she asked Swamiji. The decision was not so sudden as it appeared. For some time, the thought had been growing in Swamiji’s mind. Her question merely confirmed what he already felt to be Divine Mother’s will. Soon after, she also moved to the community, and in time received the spiritual name Premi. There was no suitable place at Ananda Assisi, however, for Swamiji to live. Most of the housing is rented from a neighboring landlord. Whenever Swamiji came to visit, someone would vacate his home so that Swamiji would have a place to stay. “The work in America is going well,” Swamiji explained, when he announced that he was moving to Italy. “Those who are in charge of our communities make the same decisions I would. My presence in America, even at The Expanding Light retreat at the Village, doesn’t have that much impact on how the work goes. There were other reasons as well. 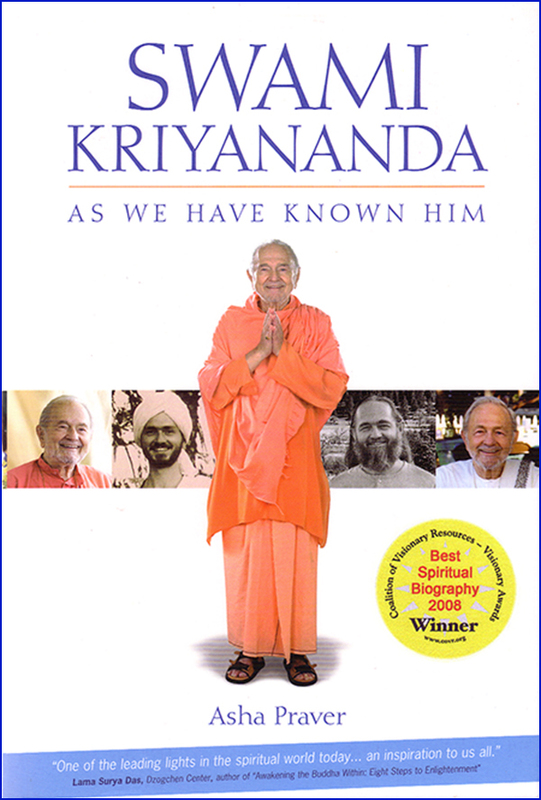 Swamiji had long since turned over to others the responsibility for running Ananda Village. For years before, however, he had been at the heart of everything that happened there. As long as he continued to live at Crystal Hermitage, people would continue to ask for his input on personal and community matters. It was a hard habit to break, even for Swamiji. “I want to help people,” Swamiji said simply. His apartment at Crystal Hermitage is completely private. Looking out the window, all he sees is a vast expanse of national forest and the Yuba River in the canyon below. From inside the apartment, he can’t hear anything that is going on elsewhere in the Hermitage. The community facilities, however, are just a few steps outside his door, so even when he is alone, he is still surrounded by the vibrations of Ananda. The community in Italy had developed without Swamiji’s direct involvement, so they didn’t have the same habit of seeking his advice on so many matters. He could spend most of his time alone writing and then be available to guests and residents on the weekends. An isolated piece of land was found about a half mile from the retreat. It was close enough for the community to provide the friendship and support Swamiji needed, and far enough away to give him the freedom to think in new ways. The loan from Germany would cover the cost. It was more land than he needed, and the extra portion could be subdivided and sold to help pay back the loan. The land was purchased in the name of an Ananda member. Swamiji paid back the price of both the house he built and the land it sits on within a year. For years, Swamiji had been interested in houses made from prefabricated kits as a way for Ananda to build quickly and economically. In his travels around the world he had seen several beautiful models. No one, however, had taken up the idea. This was his chance to try it out. The core of Seva Kutir is a kit based on a design developed in Sweden. The house isn’t large; Kutir is an apt name for it. Upstairs, there are three rooms radiating off a cozy living room. Downstairs, there is a meeting room large enough to hold several dozen people, and a spacious office where Swamiji writes. Ananda builders came from all over the world. With the help of the kit, the house went up in record time. Seva Kutir proved to be just the sanctuary Swamiji had hoped for. It is well off the main road, surrounded by woods and open fields. Even the phone rang only occasionally, and then it was usually a call from America. In this quiet haven, he wrote some of his most profound books, including many with a notably universal appeal, such as Hope for a Better World, The Promise of Immortality, The Hindu Way of Awakening, a new edition of Out of the Labryrinth, and Conversations with Yogananda, among others. His secluded life at Seva Kutir, however, ended abruptly in October 2003, on the very day he completed Conversations with Yogananda. When he was a young disciple, Master said to him, “Write down what I say.” The understanding was that someday Swamiji would write about his guru. Some of the contents of the notebooks appeared in his autobiography, The Path, and also in The Essence of Self-Realization: The Wisdom of Paramhansa Yogananda. Much material remained, however. Conversations with Yogananda offers the rest of what was in those notebooks. When he was in the last stages of writing Conversations, Swamiji felt an inward call from Master to go to India and complete the work he had had to leave unfinished forty years earlier when he was expelled from SRF. One hour before friends from India and America converged at Seva Kutir to discuss plans for that work, Swamiji finished the last page of Conversations. A few weeks later, in November 2003, he left Italy to live in India. “How long are you going to be in this country?” Indian devotees asked Swamiji. Devotees all over the world were as eager as Swamiji to get Ananda going in India and willingly donated the money needed to buy a house there. It is called Guru Kripa because it is a gift from Master to serve the work in India. The harsh climate and the stress of starting a new work at his age had already taken a toll on Swamiji’s health. It was no longer practical for him to live alone. Fortunately, Guru Kripa is much larger than Seva Kutir or than his apartment at Crystal Hermitage. Six people live there with him. They include Dharmadas and Nirmala, the leaders of Ananda’s work in India. Most people, when they shop, like to look around before making a selection. Swamiji goes by intuition. Even if he has never been in a store before, or has nothing particular in mind when he walks in, he usually goes directly to the item he will buy. Even for a large purchase like a new computer, Swamiji uses the same method. One day he went into a huge electronics store and walked right to the model he wanted. It took less than five minutes. Swamiji knows very little about computers and relies entirely on the expertise of his secretary, who wasn’t with him. Later, however, his secretary researched the options and confirmed that Swamiji had intuitively picked out just the model he himself would have recommended. Swamiji would only go to stores where the vibrations were uplifting and he was treated like a friend, not merely like a customer. Even if there was good merchandise at a better price somewhere else, friendship and the quality of the energy were more important to him. One store in particular won his loyalty. The owner attributes the success of his entire business to the blessing of having Swamiji shop there. Even now, the manager personally makes any deliveries needed at Swamiji’s home in order to have his darshan. For the shared rooms in Guru Kripa, Swamiji chose a soft golden color, enlivened with touches of burgundy and cherry red. There isn’t enough land around Guru Kripa to have a proper garden, so Swamiji brought the garden inside in the patterns of many of the curtains and carpets. In the main living room, the sheer curtains that give privacy in the daytime are covered with hand-painted flowers. The heavier drapes, drawn in the evening, are made of silk and reflect the lamplight in such a way that the whole wall seems to glow. In his office, the curtains are embroidered with flowers in shades of blue and white. In his bedroom, over a large curved window, the drapes are a lavender jacquard with a pattern of irises. At night, the streetlight glows through the fabric and, from inside the room, the curtained window looks like a wall of luminous flowers. In Space, Light, and Harmony, Swamiji makes the point that it is helpful to keep a sense of humor about your home as well, at least in some area. Ananda Village is nearly 200 miles from the ocean. At Crystal Hermitage, therefore, at the bottom of an internal stairwell, Swamiji created his his own private “beach,” with a photomural of the ocean and a sandbox with sand and shells from Hawaii. To complete the effect, he added a recording of surf that goes on and off with the light switch. In Guru Kripa, Swamiji installed a fake fireplace in an upstairs sitting area. The temperature hovers around 100 degrees for months at a time, so a fireplace can only be a joke. The impression of “glowing logs” is created by colored lights and paper. Even though Swamiji describes Guru Kripa as “one of the most beautiful houses I have ever lived in,” he relates to it with the same detachment he felt for both Crystal Hermitage and Seva Kutir. “I could walk away in an instant and never look back,” Swamiji said. This is no idle comment. Already he has done it twice, first leaving Crystal Hermitage for Italy, then Seva Kutir for India. Nayaswami Asha is Spiritual Director of Ananda Palo Alto. Her sermons and classes are extremely popular, and most are available online. She was a founding member of Ananda Village, having first met Swami Kriyananda in 1969.